While reading this article, I wondered how to compare appearance of all moons of our Solar system's planets, as they are visible from their parent planet's surface. So I've opened this thread and will post here some observations made by SE. You are welcome to join in this work! The apparent size of the closest moons (Amalthea, Io and Europa) is changed significantly depending on it's height above the horizon - because Jupiter is a huge planet, moon's parallax is big enough. The maximum angular size each moon reaches at zenith. Io is just a bit bigger than our Moon visible from Earth, almost 36 arc minutes. Europa and Ganymede appears almost identical in size, 18 arc minutes (Ganymede is a bit bigger), and Callisto is only 9 arc minutes. So, Galilean moons apparent size is decreasing as 4:2:2:1 - the perfect sequence! Amalthea is big enough to be resolved by naked eye, about 5 arc minutes. Despite its irregular shape, its visible shape is almost perfectly round, because it's oriented by it's longer axis toward Jupiter. Edit: I'd forgot to mention about the moon's brightness. Apparent magnitude of the full Io is almost as our Moon - about -11.2m (despite the higher distance to Sun, Io has a bigger albedo). 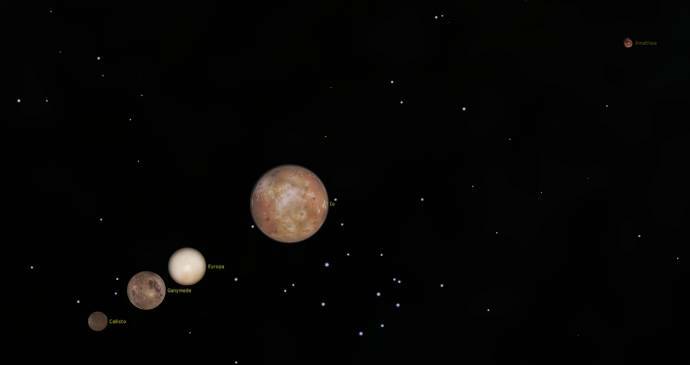 Europa and Ganymede are -9.7m and -9.4m, and Callisto is -7.0m. Of course, you can't see the moons in full phase, because at this phase they will be inside Jupiter's shadow. Quick info about other biggest moons: Titan is visible from Saturn's equator as an orange disk 16 arc minutes in size - a bit smaller than Europa and Ganymede. Triton's apparent size from Neptune's surface is 28 arc minutes - like our Moon! 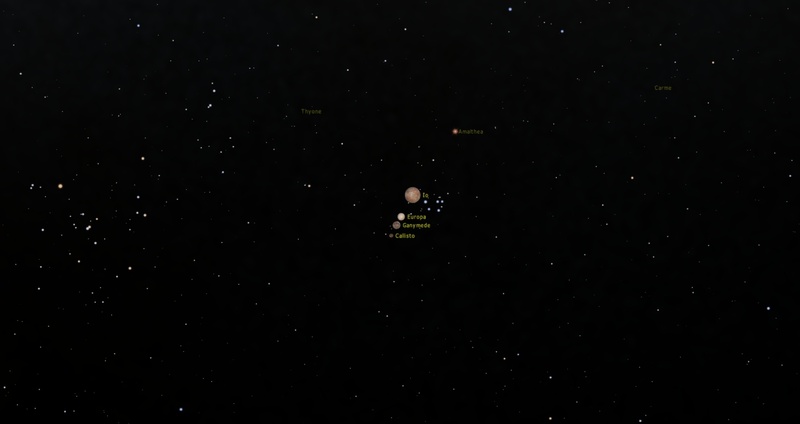 All other moons of the planets are much smaller. So Io is the biggest moon in planetary sky, our Moon is next, and Triton is third place (it is about their maximum size, it may change significantly due to geocentric parallax and orbital position). But of course, if we will consider dwarf planets, the biggest moon will be Charon - it's maximum angular size from Pluto's surface is about 3,4°.